We're not kidding. Tarantula burgers are a thing. 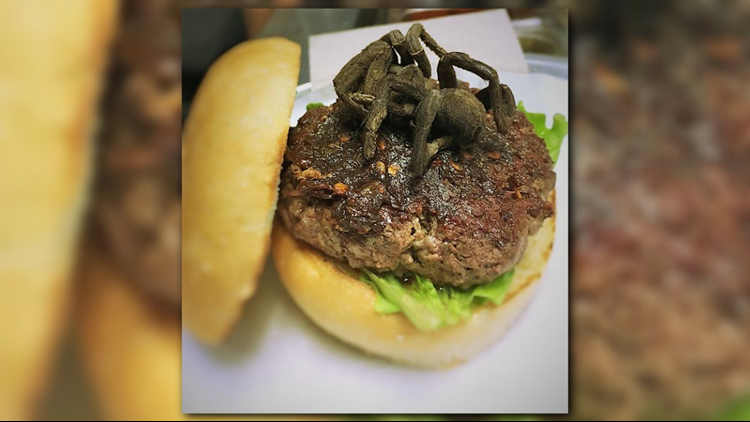 For Exotic Meat Month, Bull City Burger is serving up a 'Tarantula Burger.' And no, just because it's in quotation marks doesn't mean it's figurative. DURHAM, N.C. – Every April, Bull City Burger and Brewery hosts “Exotic Meat Month,” celebrating exotic meats eaten around the country and the world. This year, they’re serving up a ‘Tarantula Burger.’ And no, just because it’s in quotation marks doesn’t mean it’s figurative. A hairy, chargrilled tarantula sits right on top of a juicy beef patty for your taste buds to munch on. But there’s a catch (in case eating a tarantula wasn't already a struggle): The Tarantula Challenge is by lottery only. The challenge began April 4, and will continue every day while the creepy, crawly supply lasts. Once the raffle number is drawn, the winner has 2 days to schedule a date with their Tarantula Burger: a pasture-raised NC beef burger, gruyere cheese, oven-roasted tarantula, and spicy chili sauce. Oh, and it comes with a side of Dirty Fries, all for just $30! Winners, aka those who eat the whole burger, will get a limited-edition Tarantula Challenge t-shirt and bask in arachnid, social media glory. Our Digital Reporter Laura Brache is challenging the challenge and will enter the raffle if she gets 100 retweets on this tweet. Bull City Burger is open Monday through Thursday from 11:11 a.m. to 10 p.m., Friday and Saturday from 11:11 a.m. to 11:30 p.m., and Sunday from 11:11 a.m. to 10 p.m. and located at 107 E. Parrish St. in Durham.